A swirl of sharks towering three stories above Wacker Drive will be the defining feature of Barrier Reef. 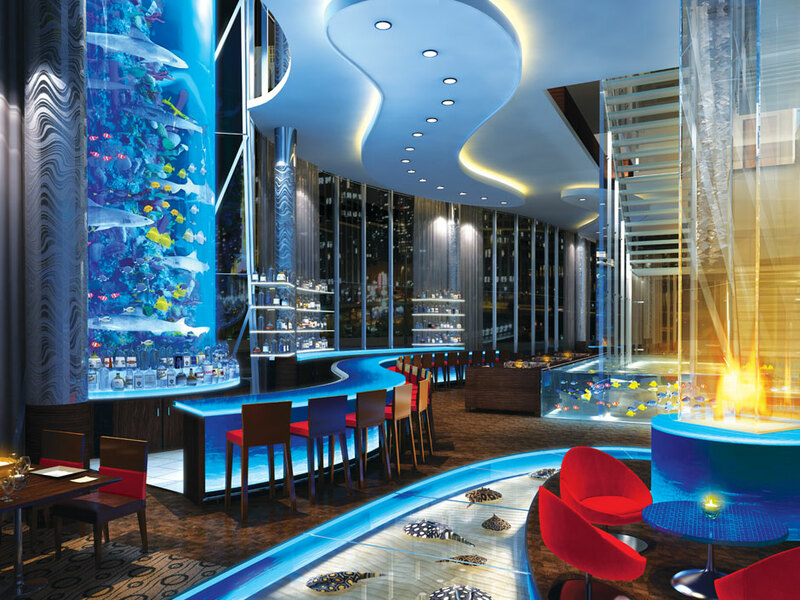 Vivid corals, the cast of Finding Nemo, and the sea's ultimate predators in a 30-foot cylinder of glass will rivet the attention of restaurant patrons and outside sightseers alike. Barrier Reef is destined to become the glowing, animated proscenium of Chicago's new Riverwalk! There will be no staring into drinks when surrounded by this cast of vibrant fish swimming among the beautifully hand-sculpted coral designs. Guests sitting anywhere in the lounge will be riveted by the amazing shark tank. Another eye-catching experience—Chicago's cityscapes and river views from the inside looking out—wow! Dining in the lounges will include the A-list of appetizers from sushi to sashimi and a raw bar featuring clams, oysters, crab, and shrimp. Entrees will include fresh fish, filet mignon, daily specials, and homemade soups.